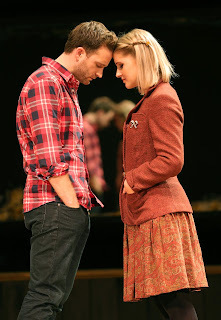 Guy (Stuart Ward and Girl (Dani de Waal) share a moment in "Once." 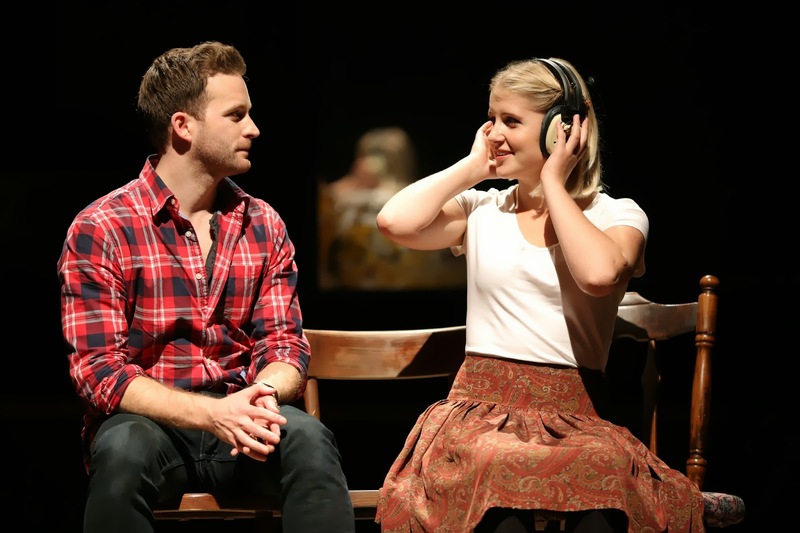 In the Tony award-winning musical “Once” (playing the Oriental Theatre through Oct. 27. 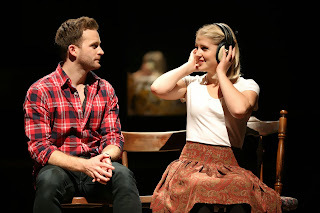 ), Guy (Stuart Ward) begins the show with a failed relationship behind him (his ex-girlfriend has moved to New York). He works his way through a song written for her on an empty street corner. The performance by Ward is so passionate, he broke a guitar string during this particular show. Disgusted by the lack of a street audience (and perhaps the broken string), he tosses the guitar into its case and walks away from it. Life –and in particular, life’s disappointments, have a way of scaring us so much, we become immovable. Guy is very much frozen where he is at. Crashing in a child-size bedroom in a tiny flat he shares with his widowed “Da” (a fine-voiced Raymond Bokhour), above the vacuum repair shop where he works with his father, Guy is unable to move forward or go back. Meanwhile, life continues to happen around him. It is one of those universal truths and I immediately felt a connection to the stage version of the character that I did not feel with the film version. It’s one of many moments which demonstrates not only why this is not merely a Broadway producer’s attempt to capitalize on a known property by adapting yet another film for the stage (the show is based on the 2007 independent hit of the same name whose best known song, “Falling Slowly,” won an Oscar) but also that playwright Enda Walsh’s Outer Critics Circle and Tony Awards for best book are so rightfully deserved. It crystallizes everything about the character in both a verbal and visual way. Walsh uses the bones of the familiar film scene and manages to breathe new life and meaning to it. 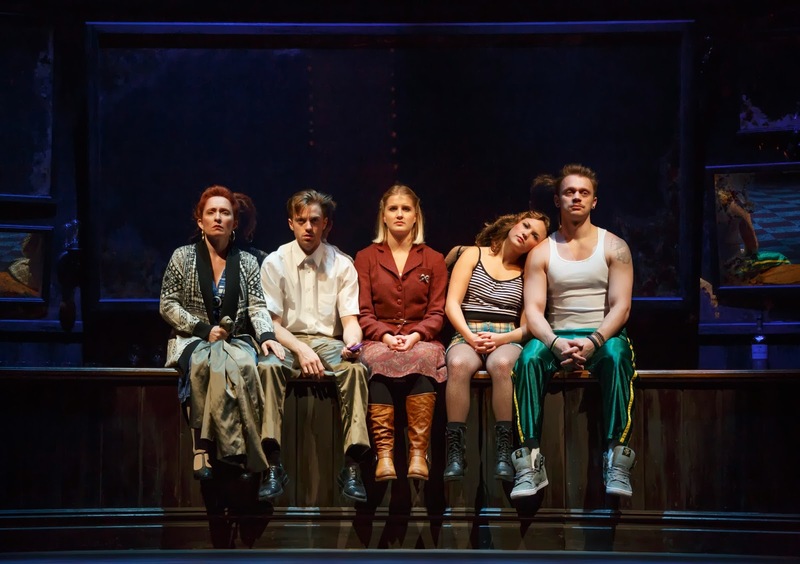 “Once” is another must-see in a Chicago theater season that is turning out to be one that will be remembered and talked about for years. 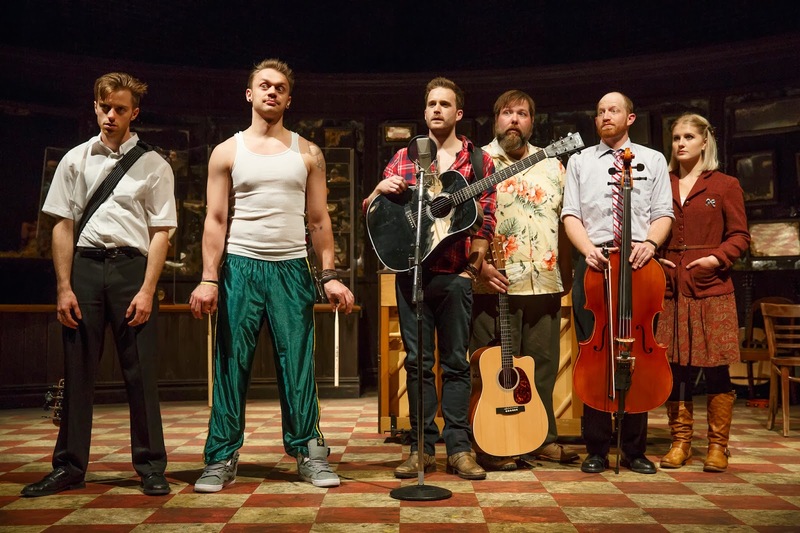 Guy is, of course, saved from merely giving up by Girl (Dani de Waal), a Czech immigrant who was drawn to his passionate street performance like a siren song and selflessly spends the rest of the show convincing Guy that his music and lyrics need to be heard. She tells him it was fate the two should meet. She also has a vacuum cleaner in need of repair. It’s worth noting that deWaal’s performance is more nuanced than the character was in the film (for one, she is not as cold and matter of fact). de Waal managed to find a few comedic moments to mine without betraying her character. 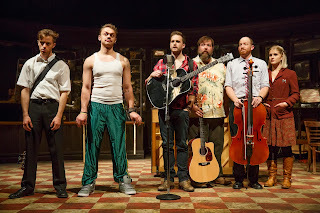 Other standouts in the terrific cast include Evan Harrington as music store owner Billy, and Girl’s flatmates Svec (Matt DeAngelis), Andrej (Alex Nee), Reza (Claire Wellin) and Girl’s mom, Baruska (Donna Garner). The performances, under the watchful eye of director John Tiffany, feel organic. The movement by Steven Hoggett seems to have an undercurrent of longing that feels appropriate for the piece. Dani de Waal (Girl), Claire Wellin (Reza) and Matt DeAngelis (Svec). I still keep coming back to Walsh’s script, though. Another scene later on between Guy and Da is rendered completely profound through an additional line of dialog written for the stage. Da simply asks Guy “How’s the heart?” It’s exactly the kind of shorthand used in close knit families. Frankly, most Broadway shows based on hit movies should be so lucky to have someone like Walsh at the wheel. Walsh has succeeded in taking a good movie and making it a great piece of extraordinary theater. . It’s a quiet, intimate musical that despite all the Tony awards has a distinct “un-Broadway” feel to it in the same way the original independent film felt “un-Hollywood.” Believe me, that’s a good thing. “Once” runs through Oct. 27 at the Oriental Theatre, 24 W. Randolph. Tickets $27-$95. Call 800-775-2000. www.broadwayinchicago.com or www.oncemusical.com.